Adnan Hajj, a Lebanese freelance photographer who was on Reuters' assignments in the Middle East for more than a decade had an unceremonial departure. The disgraced photographer turned out to an Adobe Photoshop master and digitally manipulated the images of the Israel-Lebanon conflict to make them look more dramatic. The can of worms was opened by Charles "Icarus" Johnson, a popular blogger and co-founder of Pajamas Media. 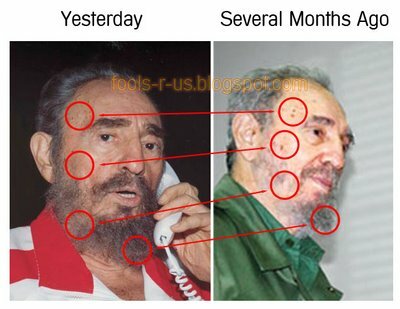 And now internet bloggers have turned their attention to the recent pictures of Cuban President Fidel Castro that show him in good health. They feel the images are altered using Photoshop and have rather strong evidence to prove it. Bloggers won't let you pass them so easily.